February 13: Meet with trustees and Chancellor's Commission at the AKU. 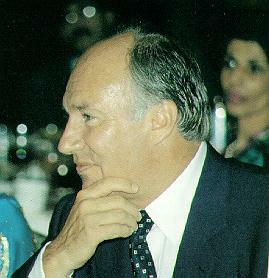 February 25, 1992: Mowlana Hazar Imam hosted a dinner at his residence at Aiglemont to commemorate the Aga Khan Foundation's Silver Jubilee (1967-1992). March 1992: English language program is launch in Zanzibar. 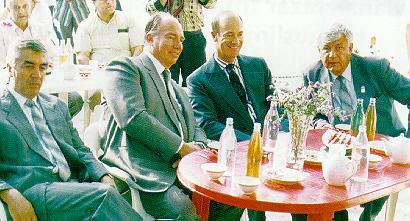 August 14, 1992: Accord of Cooperation signed between Aga Khan Development Network and Government of Canada in Ottawa. The Minister Rt. Hon. Monique Landry also announced the selection of the Aga Khan Foundation Canada for the design and implementation of a Canadian $25 million training and special development project in Pakistan. August 19, 1992: Wednesday. Hazar Imam met with the Governor-General of Canada, Mr. Ray Hnatyshan at the L'Hotel in Toronto. August 19, 1992: Hazar Imam spoke at a banquet held in Toronto, at Westin Harbour Castle Hotel. September 19, 1992: At 7:00 p.m. Hazar Imam and Governor Pulat Majidovich Abdur Rakhmanov arrived at Registan Square in Samarkand. School children strew rose petals on their path as they proceeded to take their places on the platform in front of the Tila Kari Madressah. September 19, 1992: Hazar Imam addressed an international conference at Samarkand's historic Registan Square at the fifth cycle of the Aga Khan Award for Architecture where nine projects were the winners. Hazar Imam said that the task of the Award was "..to build a space for reflection and debate on the meaning for Architecture of these patterns of change within the unchanging dimensions of Islam." Nine projects received the prestigious 1992 Aga Khan Award for Architecture. September 21, 1992: Hazar Imam was invested with the Honorary citizenship of the city of Samarkand by the Mayor Aziz Nasirov and Governor Palat Majidovich Abdur Rakhmanov at a civic reception(photo). October 14, 1992: A.K.F.E.D. enters into joint venture with the Alcatel Group and Pakistan Telecommunications Corporation to manufacture digital switching systems in Pakistan. The foundation stone ceremony in Islamabad was laid by Prime Minister Nawaz Sharif. October 23, 1992: Hazar Imam met with the President of the World Bank, Mr. Lewis Preston in Washington, D.C. and exchanged views on development. November 9, 1992: Hazar Imam arrived at Bombay's Santa Cruz Airport to a red carpet welcome as a guest of the Government of India. Hazar Imam was then driven in an official motorcade to the Raj Bhavan where he stayed as State Guest. (click here) Hazar Imam also gave Holy Deedar to Indian Jamats at many locations during this visit. November 14, 1992: Speaking at the fifth triennial Aga Khan Award for Architecture, Hazar Imam said that modern Muslim architecture must relate to spiritual values (speech). November 1992: Visit to Pakistan. Granted Deedar to Jamats. November 14, 1992: Hazar Imam attended and spoke at a banquet hosted by the Vice-President of India in New Delhi. 1992: Created the Historic Cities Support Programme (HCSP) to promote the conservation and re-use of buildings and public spaces in historic cities in ways that can catalyse social, econimic and cultural development. Mowlana Hazar Imam launches AKF Celebrations. Mowlana Hazar Imam with Members of the AKF Board and Representatives of the Geneva authorities. Mowlana Hazar Imam receiving a warm welcome. With Canadian Prime Minister Brian Mulroney at Harrington Lake. Taking a walk with Canadian Prime Minister Brian Mulroney. In discussions with Canadian Prime Minister Brian Mulroney. Being wished farewell by institutional leaders. Mowlana Hazar Imam and President Islam Karimov alighting the aircraft at Samarkand airport after flying together from Tashkent. Mayor Aziz Nasirov and Governor Pulat Majidovich Abdur Rakhmanov investing Mowlana Hazar Imam with honourary citizenship of the city of Samarkand. Mowlana Hazar Imam and Prince Amyn in a happy mood in Bukhara. The Governor of Samarkand Region, Mr. Pulat Majidovich Abdur Rakhmanov is to the left of Mowlana Hazar Imam. Addressing an audience of international guests and government and civic officials in Samarkand's historic Registan Square on September 19, 1992. Nine projects receive prestigious 1992 Aga Khan Award for Architecture, "Kairouan Conservation Programme, Kairouan, Tunisia." "Palace Parks Programme," Istanbul, Turkey. "Cultural Park for Children," Cairo, Egypt. "East Wahdat Upgrading Programme", Amman Jordan. "Kampung Kali Cho-de" Yogykarta, Indonesia. "Stone Building System" Dar'a Province, Syria. "Demir Holiday Village" Bodrum, Turkey. "Panafrican Institute for Development" Ouagadougou, Burkina Faso. "Entrepreneurship Development Institute of India," Ahmedabad, India. Mowlana Hazar Imam and President Islam Karimov and Mowlana Hazar Imam alighting the aircraft at Samarkand Airport. President Islam Karimov expressing gratitude to Mowlana Hazar Imam for choosing Samarkand as the venue for the 5th Aga Khan Awards for Architecture ceremony. Mowlana Hazar Imam addressing the audience at the 5th AKAA in Samarkand's historic Registan Square. Mowlana Hazar Imam wearing the traditional robe while delivering the speech. The President of the World Bank and Mowlana Hazar Imam meeting in Washington, D.C.
Mowlana Hazar Imam paying His respects at Rajghat, the Samadhi of Mahatma Gandhi. Mowlana Hazar Imam with the President of India, Dr. Shanker Dayal Sharma, at Rashtrapati Bhavan. Mowlana Hazar Imam with The Prime Minister of India, Shri P.V. Narasimha Rao share a light moment during their private meeting. The Vice-President of India, Shri K.R. Narayanan bidding farewell to Mowlana Hazar Imam. A warm greeting for Mowlana Hazar Imam from Indian architect Mr. Romi Khosla, at the Vice-President's banquet in Mowlana Hazar Imam's honour at Hyderabad House. Mowlana Hazar Imam meeting Jamati members. Volunteers watch Hazar Imam proceed to the next mulaquat. Mowlana Hazar Imam in a relaxed mood at an official banquet. Lush greenery surrounds welcoming floral arches. A final few words before another departure. Jamati leaders greeting Hazar Imam. Mowlana Hazar Imam arrives in India. A warm and respectful welcome. Being received at Surat airport. With the Jamat in Surat. At Keshod Airport for Malia Hatina Mulaquat. Hazar Imam greeting a guest at the Bombay banquet. Scouts salute Mowlana Hazar Imam in Shamiana. An attentive pause with Jamati leaders. A cheerful Hazar Imam at Nagpur Airport. A dignified reception line in Hyderabad. Final "Khuda Hafiz" to India.